We’re a full service marketing agency with expertise in digital marketing strategy, website design and development, social media marketing, and search marketing. 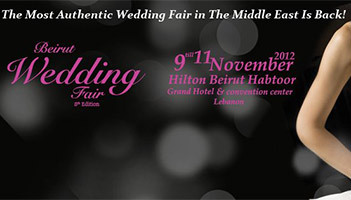 Dana agency was invited to attend The Beirut Wedding Fair that was held from the 9th till 11th of Nov’12 at the Hilton Beirut, Habtour Grand Hotel. The fair is considered the number one wedding exhibition in the region. It hosted a different array of pioneers in the industry: Designers of Bridal Haute Couture and evening wear, Wedding planners, Jewelers, Floral Decoration Artists, Hair Designers and Beauty Salons, Travel Agents, Photographers, Daily fashion shows and many more.